Another successful Lego Mindstorms robotics mission! STEM Club – Another “nearly but not quite there” Lego Mindstorms moment! STEM Club – Another successful Lego Mindstorms mission! STEM Club is a Science, Technology, Engineering and Maths club. 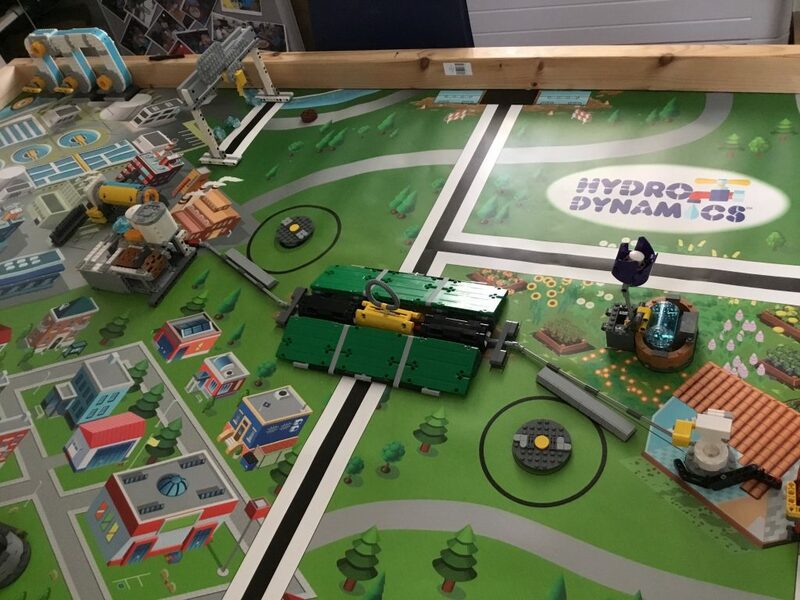 We are doing the First Lego League for Hydro Dynamics pupils can join any time but there is a competition and if we win the competition we go onto another competition and if we win that competition we get the chance to go to America. We have already made the lego pieces and set up the mat and today we planned what our robot is going to look like so it can do as it is told. As an example for one of the missions we have to do. So the example that I’m going to tell you is the rain cloud what you have to do is you have to get your robot to push a lever and make at least one rain fall. On the 5th of October AFTER SCHOOL is the p6/7 badminton competition at Dunblane high school if your child IS doing this they should have already given in a form of permission. If your child is competing in this compition what will be happening is your child will be against various people depending on how much wins they get. If your child gets into the quarter finals they just need to get to the semis. If your child gets into the semi finals if they win your child will get into the finals if they DONT win they will face the other loser challenging for the place of third. If your child gets into the finals your child will be playing for the place of second or first. On the 19th of January the new master classes will kick off. From 13:30 to 15:00 p1-7 will be doing two choices of activities. The p1-3 choices are Scottish dancing, baking, ceilidh dancing or music. The p4-7 activities are club golf, micro tyco or art. The whole school are really excited about these new activities. All the pupils are really excited about doing them again. P5-7 are starting the cross country club again. This will be starting on the 10th of January. Mrs White will be in charge of coaching and leading the pupils to events in the near future. The group of enthusiastic pupils are now training twice a week. Everyone in the club has been training extremely hard to do their best in the upcoming competitions at the Laighills. Their first training session was on the first Thursday back from the winter holiday and Mrs White and the helpers said we did very well and are going to do well in the competition. Primary 5 will mix in with the primary 6/7 race because they are in the cross country club. Everybody in the cross country club is looking forward to competitions and are hoping to achieve their personal bests. Friday afternoons are all change, we now have master classes where our aim is to learn and develop new skills to help us in and out of school. At the start of term we got a list of our options and we had to put our first, second and third choices. This was difficult for a lot of people because there were a lot of activities to choose from. Everybody got either their first or second choice, which was great! P1-3 choices were music/composing, tennis, Spanish, team-building and outside learning and baking. P4-7 choices were skiing, team building and outside learning, Spanish, arts and crafts and athletics. Before we start the master classes we have a discussion about what we want to learn and what we know and after each master class we share what we have learned. The master classes are great fun and everybody is enjoying them. On the 14th of September some of the p4/5’s started doing a gardening club. Every Friday afternoon the p4/5’s used to go out and plant lots of flowers and water the ones that were already there. Mrs Kinvig takes the club and will be taking over from Mrs Hewitt in the eco committee. The gardening people are still going to be helping with the garden. They have planted some new plants for winter and spring and they will hopefully bloom with lots of colour. We hope you will like the new garden. As you know Friday afternoons are activity afternoons at St Mary’s and we have two one hour blocks of activities. Last year as well as the Active Stirling taster sessions children also had the opportunity to take part in ICT, music, art, drama, gardening, dance and sports including tennis, cross country running, yoga, walking etc. Fitting two activities in has been challenging in terms of timing so to make it easier to manage I am moving lunch time on a Friday forward by 15minutes which means that lunchtime on a Friday will be from 12noon until 1pm. Thank you to all the parents who have helped during Friday Activities so far. Any other volunteers would be made most welcome. If you have a skill you would like to share or would like to help please let you child’s teacher know. This session a group of parents supported by Active Stirling have volunteered to run two after school sports clubs. TOP Play will be on a Wednesday 3.15-4pm for pupils in P1-P3 and TOP sport will be on a Monday 3.15-4.15pm and will be open to pupils in P4-P7. Both clubs will give children the opportunity to try a range of sporting activities over the course of the year. Many thanks to all the parents who have organized after school activities over the years and to those who have already volunteered to continue helping. More volunteers are always welcome. Parents who cannot commit to a whole year but who would be willing to help for a block of time or on a relief basis would also be very welcome. Training, support and Disclosure Scotland Checks are all organized by Active Stirling. In May and June Mr Holmes and Mrs Tullis ran cycling proficiency classes after school on a Thursday night for pupils in Primary Six and Seven. The lessons were lots of fun and the children learned lots about how to cycle safely. On the 3rd of June we had a cycle morning. The people that came where from sustainable Dunblane and they were checking our bikes so they would be safe to ride to school. We had race but not any old race you had to go as slow as you can and you cannot put your feet down. He checked our brakes and tyre pressures and our seat height. We all had a great time. At the last tops club there was a hockey match with the parents and the children. There were 2 children teams and 1 adult team. They started with the two childrens teams playing against each other one team bib the other not. The bib team (winning team) played the adults and then the bib team played the adults. The parents were very impressed the adults lost both their matches and so came last and the bib team came 1st and the no bib team came 2nd. Archie’s favourite bit was playing the adults because they beat them.